Michael O’Mara Books (MOM Books) has been a McBrides client since the company incorporated in December 1984. 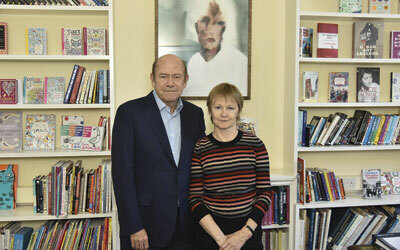 At the time the publisher’s only two employees were husband and wife team Michael and Lesley O’Mara, and their office was the spare bedroom in their Clapham home. They first met at a book packaging company, Rainbird, where Lesley was head of sales and Michael was head of publishing. Having decided to launch their own publishing house, their first collaboration was with ITN, which suggested a full colour book celebrating the Queen Mother’s 85th birthday – in just six weeks’ time. Having risen to the occasion and published The ITN Book of the Queen Mother by Alastair Burnet in July 1985, their first book was a number one best-seller and MOM Books published several more books with ITN. They are known for being fast on their feet and got into The Guinness Book of World Records by producing a full colour book in just three days – Prince Andrew and Sarah Ferguson were married on a Wednesday and the title was in bookshops the following Saturday! Over 30 years later, they remain one of the few privately owned independent publishing houses, have a backlist of over 1,000 titles, and produce about 150 new books a year. Michael is Chairman, Lesley is Managing Director and the business employs 50 people across four charming mews buildings in Clapham, south west London. The publisher also has two other imprints (publishing names): LOM ART, which focuses on artist-led creative titles; and Buster Books, which creates books for curious and creative children. One of MOM Books’ first authors was the investigative journalist Andrew Morton. When Michael first saw the manuscript for Andrew’s biography Diana: Her True Story, he needed proof of credible sources behind it. “We just couldn’t believe it when we heard the recorded interview tapes. It was a very exciting time” says Lesley. Published in June 1992, the book sold more than 10million copies worldwide and bookshops could not keep up with demand. There was also much for the MOM Books team to manage ahead of publication: “It was secretly printed in Finland to keep the media at bay, although one enterprising journalist pretended to be Michael and tried to intercept it on the day it was printing”. Elsewhere, a French newspaper published excerpts before publication day creating havoc with serialisation agreements around the world. “And then Andrew was grilled by the Today programme on the day of publication as they just couldn’t believe that this story was true. They accused him of making it up”, says Lesley. Known for spotting trends before they become popular, MOM Books specialise in adult non-fiction from history and popular science to language; biography to puzzles; gift and humour to craft. They introduced the first adult colouring book in 2013, Creative Colouring for Grown-Ups, which started a global publishing phenomenon. Another commercially astute decision made by MOM Books earlier this year was to handle all export sales directly through its sales team rather than relying on a third party: “Succeeding as an independent in a publishing world dominated by vast, multinational conglomerates is not easy, but it is fun and we’re constantly finding ways to rise to the challenges,” says Lesley. Perhaps it’s of little surprise that Meghan: A Hollywood Princess by Andrew Morton is Lesley’s recommended read for the summer and tipped for their autumn best-seller is The Magical Unicorn Society Official Handbook.